Life With 4 Boys: Does Megamind Have ADHD? Not a question you would normally expect to hear while watching a video with your kids, but hear it I did. My oldest son who is 10 years old has been diagnosed with ADHD for about 7 months now, but has suffered from behavior problems his whole life. It took me a minute to understand his reference to the main character of this movie having such a disorder, but when I really thought about it, it made all the sense in the world. Let me explain. I was lucky enough to receive a review copy of this fun loving family movie from DreamWorks a while ago when it first game out on Blu-ray and DVD. Since then, it has quickly become one of my children's favorites and is actually one that I don't mind watching time and again. This last time we watched it though, something finally clicked for my oldest and he began to relate to the main character in a whole new way. If you have a child with ADHD, you likely know that it operates on a type of spectrum and not all children exhibit the same behaviors. Joshua for instance does not have the hyperactivity problems that other kids do. He is able to sit still and focus. There are three main types of ADHD and he has hyperactive-impulsive ADHD, which means he has hyperactivity and impulse issues without inattentiveness. His main problems are anger, lying and other impulsive behaviors. Megamind, also exhibits many of these behaviors in the movie. He is a villain who you can tell is truly a good person deep down. You need only look at his loving relationship with his side kick Minion to understand that he is capable of love, although is sometimes is not so nice to his best friend. Joshua is the same way with his sidekicks brothers. In the movie, Megamind struggles with a need to succeed while is well laid out plans are constantly foiled by the forces of good. He feels he can never be as good as his rival MetroMan who is perfect at everything he does. I think Joshua and other children with ADHD feel this way often. It as if they have misbehaved and gotten in trouble for so long that they feel as if that persona defines who they are. It is what others expect of them and while they may feel there is good deep down, they don't know how to bring it out and let it shine after so long. Many times, they can justify their misbehavior to themselves by twisting other's actions around in their head. It gets to the point where they actually believe they are doing good and others are the ones who are wrong. By the end of the movie, Megamind finds the strength to be good and let his inner strength and love out. He becomes the hero that everyone looks up to and sacrifices his selfish desires to be good and serve others. Once Joshua was diagnosed with ADHD and started receiving medicine, it was like a light went on. He realized he had other options than just misbehaving or acting out in anger and frustration. He confronted his emotions and the good started to shine through. It is sad to see someone so good truly think they are bad because it is all they have ever know and this is the same thing you encounter in the movie. So, does Megamind have ADHD? Who knows! All I know is that my little boy was able to relate to a character in a wonderful family movie and it gave him confidence and hope! He is proud of the fact that he is like Megamind and I know that he is working hard and doing his best to overcome his behavior problems and let the love and goodness that I know he is so full of shine through! If you have not see Megamind yet, I highly suggest you go out and buy it today! It is a funny movie with a great message and surely would be a good addition to your movie collection. * I received a copy of Megamind on DVD for review, but was not compensated in any way for this post. All words and thoughts expressed here are entirely my own. Your son sounds a lot like mine. He was diagnosed last year. 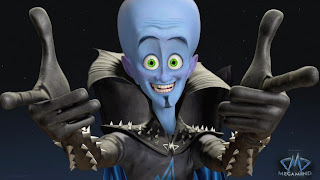 I have seen Megamind but didn't make the connection, but I can see it now. I like to point out successful and positive role models for Kellen, like Ty Pennington. Brilliant analysis! I, too, am a mom of 4 boys and our oldest, 7, has ADHD - hyperactive/impulsivity. How crazy is it that someone else out there is living my life - one that is so foreign to my closest friends!! I will watch Megamind with a whole new set of eyes. Thanks for he post!